I’m so excited for Jen from One Thimble. She’s just launched her new website and to celebrate, she has the most amazing offer! For 24 hours only, their biggest sale is happening. You can BUY ONE E-ZINE, GET ONE E-ZINE FREE! It’s no secret that I just LOVE this magazine! And I’ll tell you why in a second. But firstly, here’s all the important info you need to take advantage of Jen’s generous offer (including an affiliate link). What a perfect Mother’s Day gift! Add 2 e-zines (only two + only e-zines) to your cart. Type the code word celebrate into the coupon box and click apply. You know I’m not going to recommend something unless I truly love it! And I love everything about One Thimble. It contains a wonderful selection of PDF patterns designed exclusively for each issue. With full instructions and all the printable pattern pages, you can’t go wrong. There’s fantastic articles and lots of discount codes from many of the contributing businesses. And the best part is that it’s in digital format, so you can save the PDF file to any of your devices for easy reference! And there’s no need to wait for it to arrive in your letter box! It’s a great read! It introduces you to new pattern makers, clever creators and designers from all over the international sewing community. It encourages you to try projects that you mightn’t have thought to try before. It is so visually appealing, well laid out and easy to follow. And it’s affordable. The $25AUD cover price makes the whole collection of patterns, articles and tips excellent value for money. I was lucky enough to have my Miss Miranda and Percy Pineapple appliqué patterns included in Issue 5. Aren’t they in some amazing company? These are all the patterns you’ll receive in this issue (plus lots more). If you’d like to browse through other previous issues, you can view them HERE. You can also join the One Thimble Sewing Enthusiasts Facebook group, where you can share your creations, ask questions, and seek clarification and advice. It’s an invaluable resource, especially as many of the pattern makers are members too! This offer runs from 9am AEST time 2nd May -9am AEST time 3rd May. This offer only applies to e-zines. Gift vouchers, subscriptions and stand alone patterns are excluded. If you’d like to purchase more than 2 e-zines you’ll need to check out twice otherwise you’ll only get the 1 e-zine free. Prices on the website are displayed in $AUD. VAT will be applied to your purchase at checkout. Any questions please ask hello@onethimble.com.au. Do yourself a favour, and your mum too! Pick up your favourite issues now. You’ll regret it if you don’t! 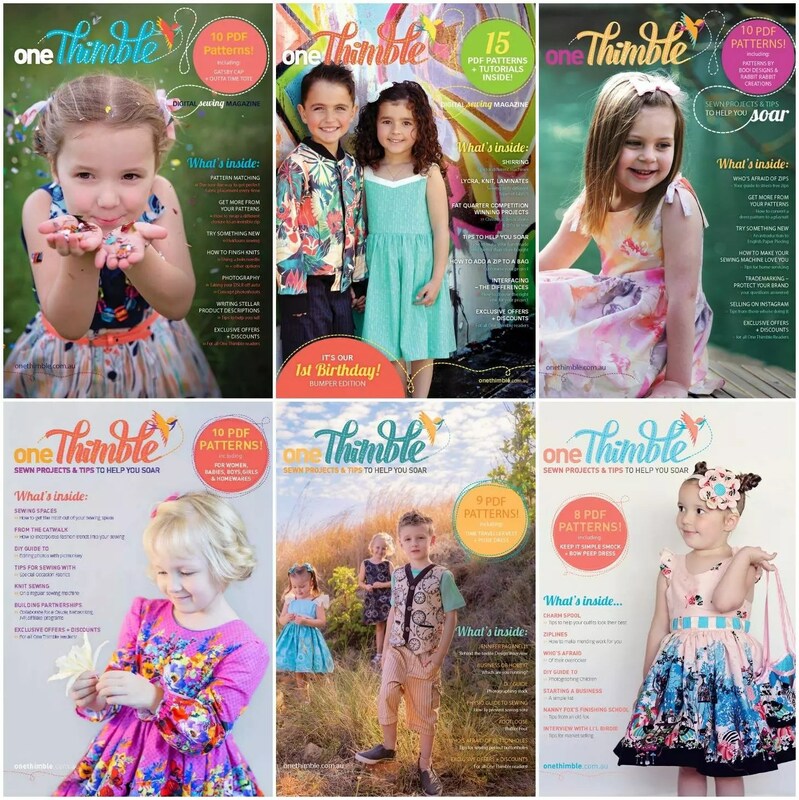 And stay tuned for the release of the next issue of One Thimble. I have a little article in there that you may like to read. Here’s hoping you have an amazing weekend. It’s been so wet here, and the cold is really setting in. So we’ll be glad to see some sunshine today.